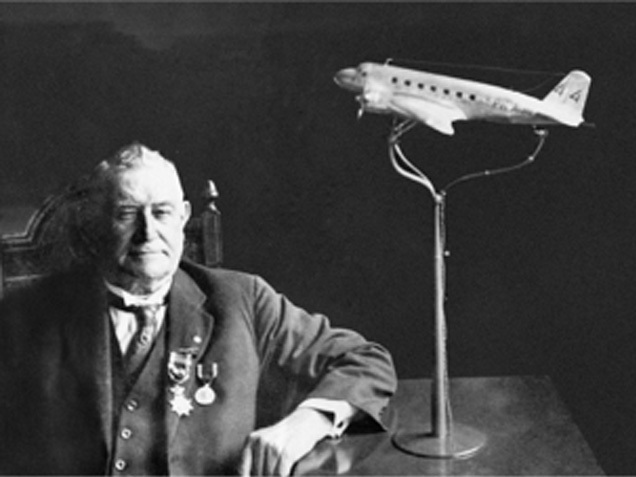 The Uiver story is undeniably one of the most significant events in local history, and an important footnote in global aviation history. The story of 2CO Radio, Albury’s remarkable people and the Uiver’s crew are one of the few occasions where the legend is less amazing than the facts. 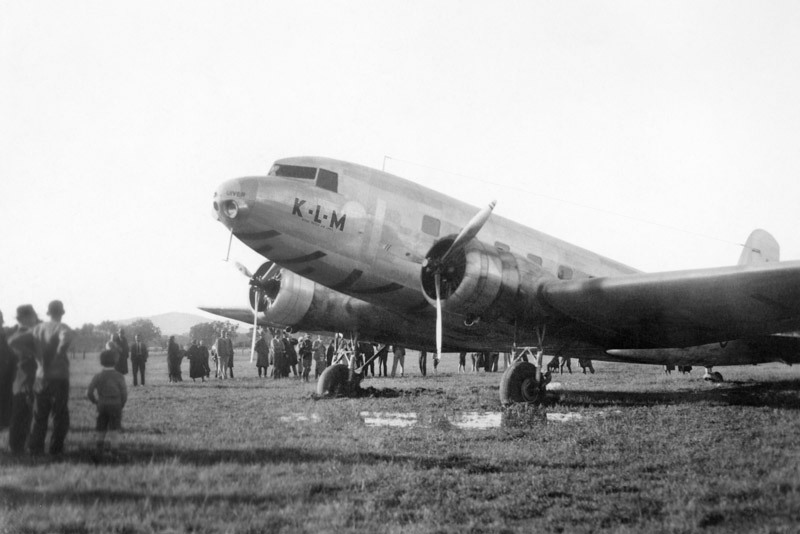 In the 1934 MacRobertson Trophy Air Race, on the final leg from Charleville to Melbourne, the KLM DC-2 Uiver (meaning ‘stork’ in Dutch), flew into an electrical storm and became lost, as the lightning was interfering with navigation equipment and radio communications. 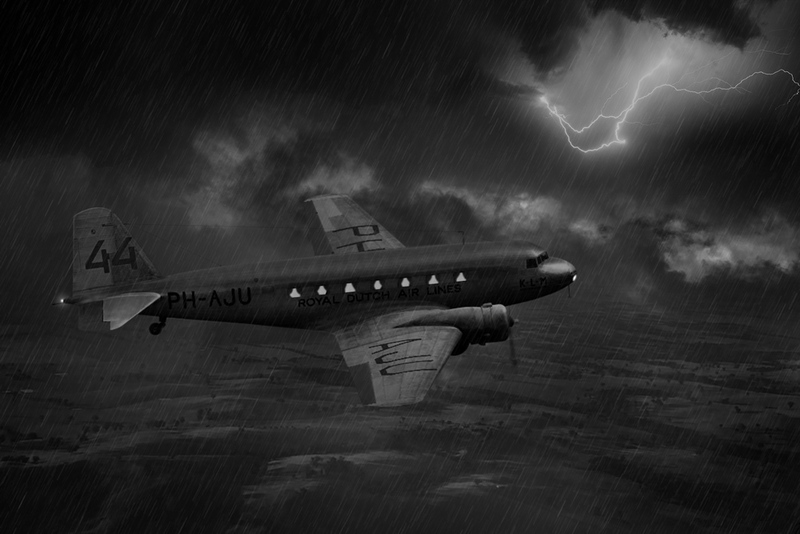 Artists impression of the Uiver lost in the thunderstorm near Albury, 23 October 1934. Captain Parmentier turned east for the coast, but was repelled by the Great Dividing Range and cloud. He turned south again and was heard going over Goulburn, Wagga Wagga and Albury. Race headquarters managed some contact with the Uiver and told them to fly to Cootamundra. Residents of farms at Tawonga heard the plane flying south late in the night and contacted local ABC radio station 2CO, who put out the alert for assistance. Fortunately the Uiver changed course to the north-east and over Tallangatta the Uiver turned towards Albury. Race headquarters in Melbourne asked Albury newspaper sub-editor, Clifton Mott, to flash a light in Morse code. Mott met with Municipal Electrical Engineer, Lyle Ferris and they bumped into District Postal Inspector, Reg Turner, who knew Morse code. All three went to the Albury electrical sub-station where they signalled “Albury” in Morse code by turning the town’s lights on and off. Arthur Newnham, the 2CO Radio announcer, called for cars to go to the Albury Racecourse to light a makeshift runway using their headlights to guide the plane to land, as there was no airport in Albury. About 80 cars arrived. Remarkably, Newnham's broadcast went out at 12:54 am, and after circling the racecourse twice and dropping parachute flares, the Uiver was safely on the ground by 1:17 am! The Uiver had successfully landed, but ended up stuck deep in mud. 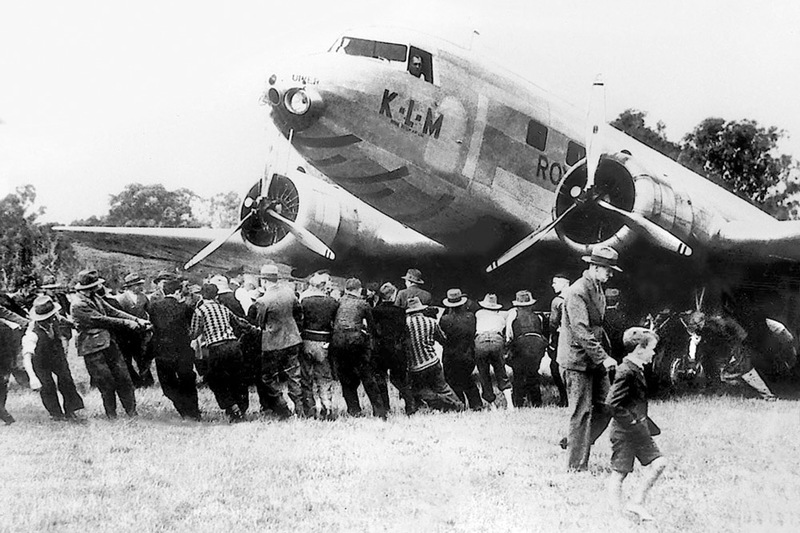 The stalwart crew were determined to finish the race, for the good name of KLM and The Netherlands, so about 300 Albury residents gathered from daybreak to help pull the aircraft out of the mud and send them on their way. The activity involved in freeing the Uiver from the mud, and allowing it to takeoff (after one false start) is well described in Doug Royal's review. The Uiver continued the race to place second outright, but they had a choice of prize and so they chose first prize in the handicap section. 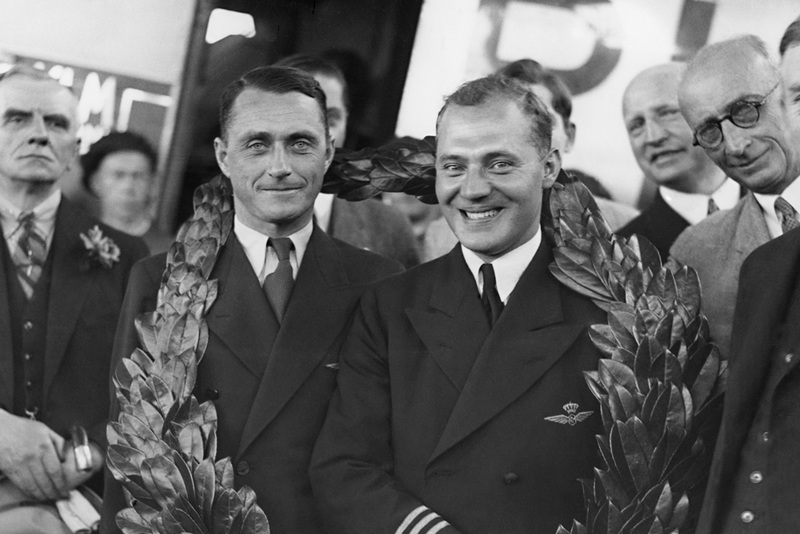 KLM Uiver pilots, First Officer Jan Moll and Captain Koene Parmentier at Laverton (Melbourne) at the end of the air race. Albury Mayor Alf Waugh with his medal and model Uiver. The Dutch Government were so appreciative of the efforts made by the Albury community that the Mayor Alf Waugh, received a title of Dutch Nobility (Officer of the Order of Oranje Nassau). King George V permitted the Dutch honour to be bestowed on the Mayor. Overwhelmed with gratitude, a Dutch delegation brought numerous gifts for key people involved in the rescue, and the Dutch people donated significant funds to the Albury District Hospital. Key Albury citizens involved in the Uiver rescue with gifts from the Netherlands. 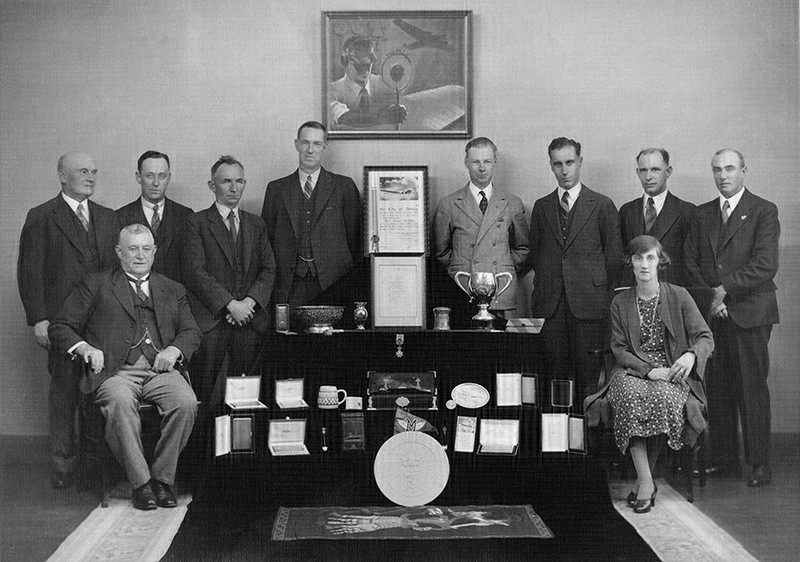 Standing L>R, Arthur Telford, Lyle Ferris, Bob Matthews, Reginald Turner, Arthur Newnham, Clifton Mott, Robert Jillard and Bertie Peacock. Sitting: Mayor Alf Waugh and Beatrice Peacock. 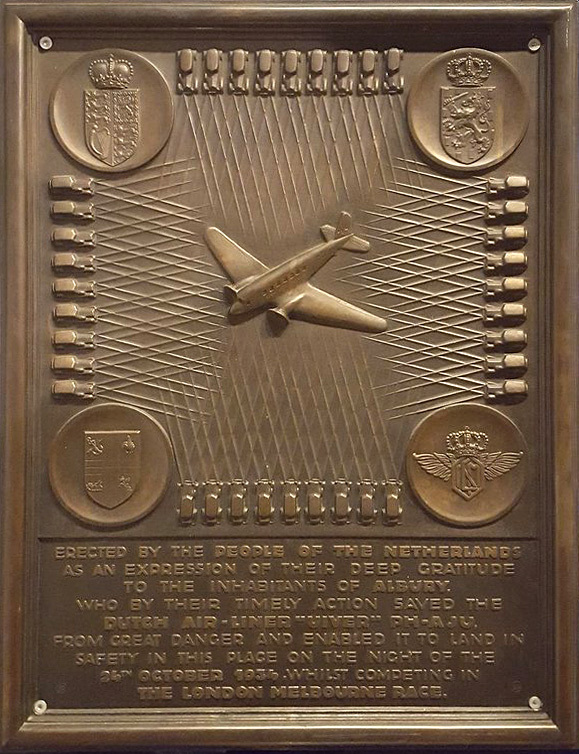 A plaque commemorating the Uiver rescue was created in The Netherlands and donated to Albury. There are four known copies of the plaque, three of which are in Albury (one each at the airport, Albury LibraryMuseum, and Albury racecourse). The fourth plaque is in Lelystadt, The Netherlands. The Uiver rescue event created a long-lasting friendship between The Netherlands and Albury, which continues to this day.